T-Mobile’s newest contest is giving you an opportunity to make the naughty or nice list and win one of five grand prizes. Answer all four questions, enter your name address and telephone and you’re entered to win one of five Galaxy Note II grand prizes which includes one year of service and a Bluetooth Moga Gaming controller. No purchase is necessary and your odds of winning depend on the number of eligible entries received. Will you make T-Mobile’s Naughty or Nice list? 1. Sweepstakes Entry: The Sweepstakes begins on or about 9:00:00 a.m. Eastern Time (“ET”) on December 5, 2012 and ends 7:00:00 p.m. ET on December 31, 2012 (“Promotion Period”). Sponsor’s computer is the official clock for this Sweepstakes. Navigate the Internet to http://www.facebook.com/TMobile (“Website”) and find the application for the “T-Mobile Naughty or Nice” Sweepstakes on the T-Mobile USA Page on Facebook. Click the “Like” button at the top of the page to unlock the entry form. You will be asked to ‘Accept Permissions’ in order to access the remaining Steps. Accepting Permissions is required in order to participate in the Sweepstakes. Complete the “Naughty or Nice?” Poll by answering a series of multiple choice questions. Complete the online entry form with your first name, last name, e-mail address, daytime phone number and date of birth. Grand Prize (up to 10 winners): Each Grand Prize winner will receive one T-Mobile “Unlimited Prize Pack” consisting of: (1) Samsung Galaxy Note II with a one (1) year contract for T-Mobile’s Unlimited Value – Talk Premium, Unlimited Data, Talk and Text Plan and up to 5GB of high speed data, and one (1) MOGA mobile gaming controller. ARV: $1,899.99 each. 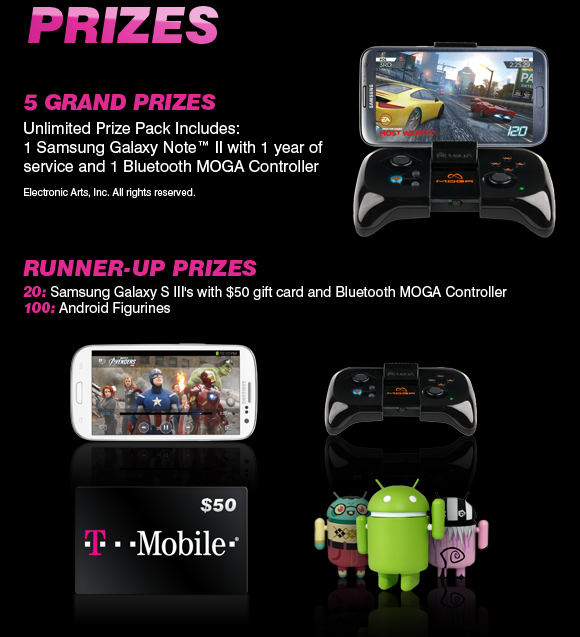 Runner-Up Prize (20 winners): Each Runner-Up Prize winner will receive one (1) Samsung Galaxy SIII mobile phone with a $50 T-Mobile gift card redeemable for products and services, including without limitation, one (1) month prepaid T-Mobile service and one (1) MOGA mobile gaming controller. ARV: $699.99 each. Third Prize (100 winners): Each Third Prize winner will receive one (1) Android figurine. ARV: $10.00 each. I never won but I’ll take the poll. I entered. Let’s see how this turns out; hopefully it turns ou better than the Power Ball tickets I bought. How many times can you enter? Can you only enter once, or is it like something where you can put in 1 entry a day? Per the rules above, only once. Multiple entries will disqualify you. Thank you, though I don’t see above where it says only one entry & multiple will disqualify you. Sorry! Answered this via my cell so I may have clicked the link provided and read it there. It’s cool, I don’t care. I’m just glad you told me about what entries are accepted or not or I would’ve got myself disqualified. Thanks again, appreciate it. Yup. They limit their audience when they only rely on these fads. I’m sure their marketing people think they are accomplishing great things by getting a few people to retweet, FB like, etc. Maybe they thought that since we weren’t on Facebook, we wouldn’t find out about their contest. ; ) I “like” businesses that open their contests to all of their customers. Aren’t most or all of these things always on FB or Twitter? I keep a FB just for offers myself. Just like spin to win…and even if you win you don’t get nothing!!! The real question is whether Carly prefers you as naughty or nice. Me, I’m naughty by nature, very naughty. Just like there service, T-Mobile leaves out a lot of people. I’m not of Facebook and millions aren’t either.